One of the Catskills' greatest claims to fame is its outstanding fly fishing. With an endless supply of lakes, reservoirs, ponds, rivers, streams, and creeks in which to cast a line, it's no wonder fly fishing has a rich history among this beautiful landscape. 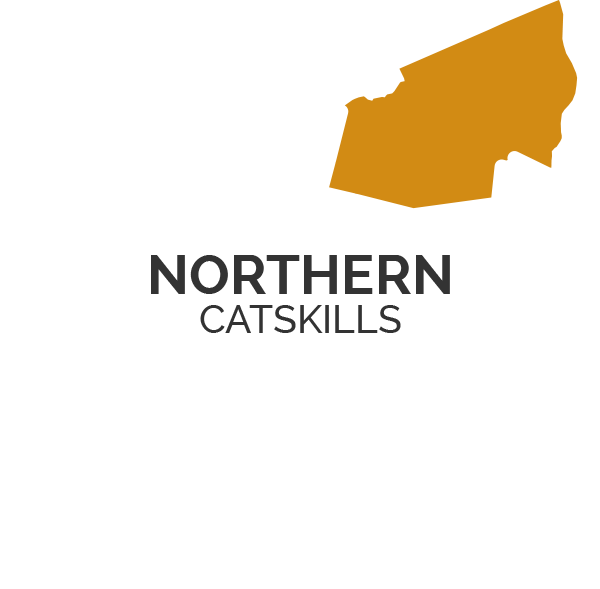 Home to some of the best fly fishing in the Northeast, there are countless places to cast a line in the Catskill Park. 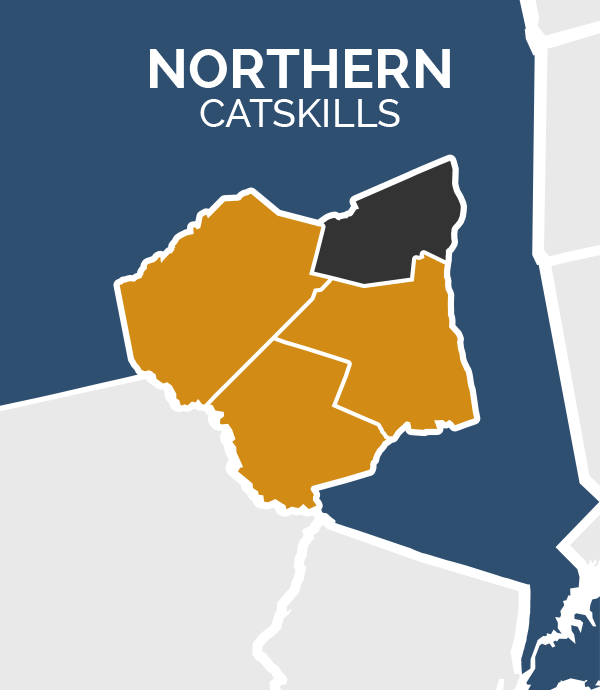 The Catskills' variety of waterways provides prime fly fishing conditions for both novice and seasoned anglers, so your chances of getting a nibble are good wherever you go. That said, it never hurts to know the not-so-secret hot spots. This small town boasts the big title of ‘Trout Town USA.’ Roscoe is home to the famous Junction Pool, where avid anglers can find prime fishing at the confluence of the Willowemoc and Beaverkill Rivers. It is also conveniently close to the East Branch, West Branch, and Main Stem of the Delaware River. Hook everything from Shad and Smallmouth Bass on the East Branch, to Wild Brown and Rainbow Trout on the West Branch. Challenge your wading and casting skills in the ever-changing main stem of the Upper Delaware, home to some of the area's biggest catches. Fish the river that started it all! This tranquil spot offers some prime catches. Esopus is a haven for world-class trout fishing, including wild Rainbow and Brown Trout. A tailwater flowing from the Shandaken portal, experts recommend casting with nymphs and streamers for best results. A less-trafficked locale, Batavia Kill boasts a variety of wild trout species, including Brown, Brook, and Rainbow Trout. Yearling and two-year-old Brown Trout are stocked annually on the lower 19 miles. As you cast your line above the waters of the Catskills, pay a silent regard to Theodore Gordon. Renowned as the ‘Father of American Dry Fly Fishing,’ Gordon set the fly fishing movement of the Catskills into motion in the 1890s. While records of fly fishing in some form date all the way back to the 2nd Century in Macedonia, and countless other cultures and outdoorsmen developed similar practices over the years, Gordon is credited with developing new fly patterns, designing regionally-specific flies, and increasing the popularity of fly fishing both regionally and throughout the United States. While wet fishing in the Neversink River, Gordon noticed that the trout seemed more interested in the flies hovering just above the surface of the water than the bait on his line. Gordon rushed home and drafted a letter to British dry fly fishing authority Frederick M. Halford, author of Floating Ties and How to Dress Them. In response, Halford sent Gordon a sample of his own dry fly lures. Gordon quickly realized that, because Halford's flies imitated British insect species, the technique needed to be adapted for Catskills waterways. Gordon began designing and tying his own dry fly patterns to mimic native insects. Along the way, the American school of dry fly fishing was created. Fly fishing has a long, rich history, and documentation of the sport’s evolution is extensive. Books as far back as the 1400s depict rods and varying fly designs. In 1613, John Denny (rumored to be a fishing companion of Shakespeare) published The Secrets of Angling, and in 1653, Izaak Walton published The Compleat Angler. Following the English Civil War, mentions of the sport began appearing in many books and treatises. In the 18th century, improved technology was added to the rod and reels and the industry began to commercialize. Onesimus Ustonson established a trading shop in 1761 that earned him a Royal Warrant and the patronage of three successive English monarchs. Ustonson also began advertising his products – and the sport itself – to members of the aristocracy, solidifying it as a respectable recreational hobby. The Industrial Revolution led to a rapid growth of the sport. Manufacturers began spinning flies on machines and mass-producing reels, and as supply rose, so did demand. Fly fishing clubs began to emerge, and more detailed guides and manuals were published for the reference of novice anglers. Modern reel designs began to appear toward the end of the 18th century, and material preferences created an international trade market around the sport. In 1874, American Charles F. Orvis designed and distributed the first fully modern fly reel. The Orvis Company was established soon after, and their circulation of tackle catalogs helped institutionalize the industry. During the 19th century, the middle and lower classes began to take up the sport. Fly fishing became a reason to travel, creating a parallel tourism industry. And, as anglers spread to more rugged waters, new techniques were needed to keep flies on the line and out of the weeds. In response, F.M. Halford developed dry-fly methods that became the foundation for all subsequent improvements, including those made by Theodore Gordon. Fly fishing in the United States peaked before the Great Depression when, like so many other recreational activities, it fell to the wayside in the face of hard times. Interest returned in the 50s with the emergence of inexpensive fiberglass rods and synthetic fly lines. Today, the sport has gained traction with anglers of all ages and backgrounds. Fly tying alone has become a popular hobby and the tourism industry surrounding the sport has grown exponentially. Fly fishermen and women continue to flock to the Catskills to cast the same tranquil waters that first inspired Theodore Gordon. Honoring Gordon’s legacy, the Catskills continues to grow and develop the sport of fly fishing. 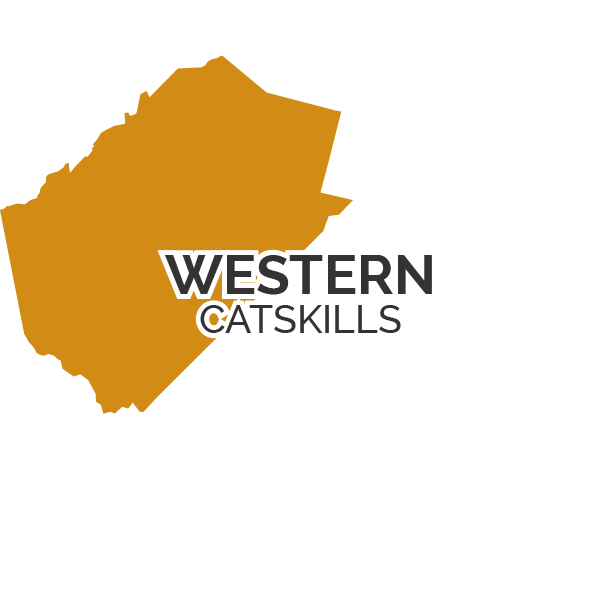 Before or after you take to the water, visit the Catskill Fly Fishing Center and Museum and the renowned Wulff School of Fly Fishing, both in Livingston Manor, or the Jerry Bartlett Angling Collection in Phoenicia. These institutions champion the region's critical place in the sport through historical exhibitions, fishing seminars, and lessons. They can also help you find prime angling opportunities! 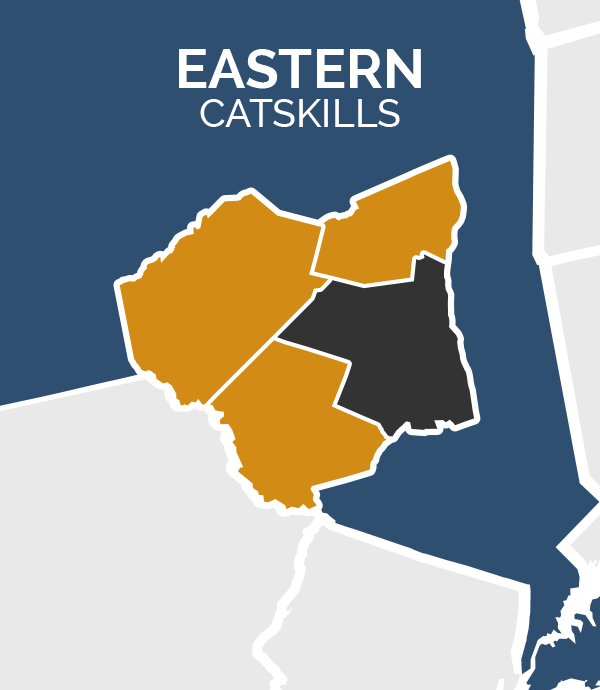 Before you head to any of these great Catskills fishing destinations, visit a local outfitter to get a New York State fishing license, rod and reel, fly lures, and locals’ tips. 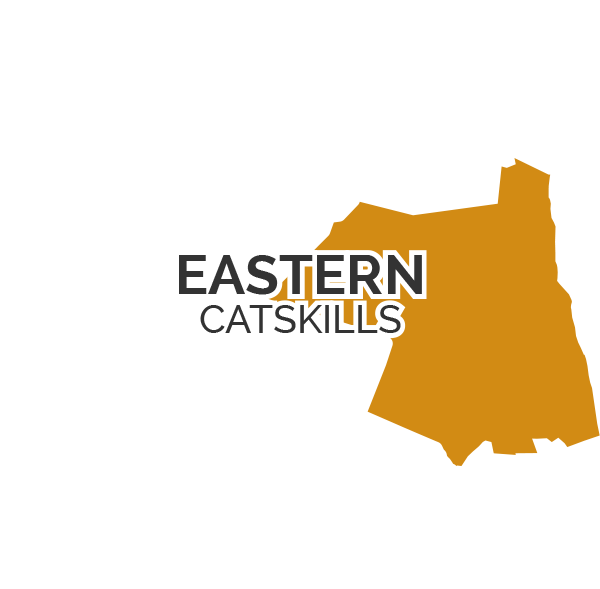 Please be sure to follow all Department of Environmental Conservation (DEC) regulations when fly fishing in the Catskills. Where it all began ... 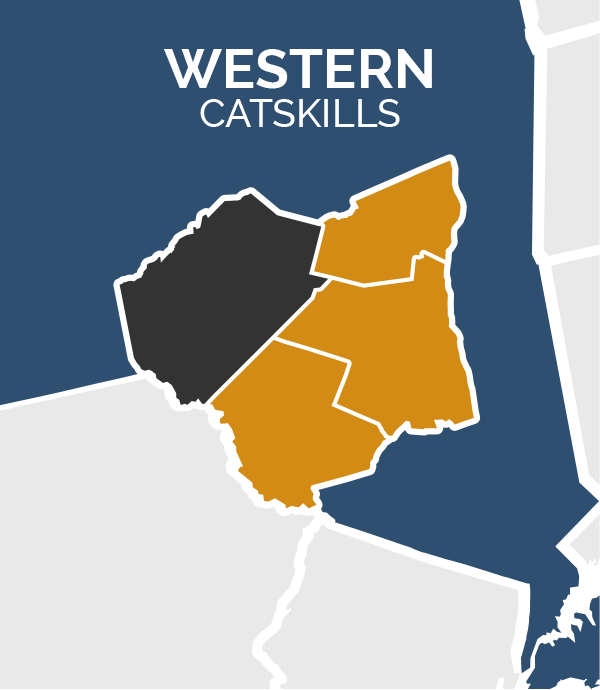 This map will take you offsite to fly fishing options in each of the four respective regions that make up the Catskills and link up with a world-class guide. Tight lines! Experience one of the best angling destinations in the country! Grab your pole, we're going fishing! 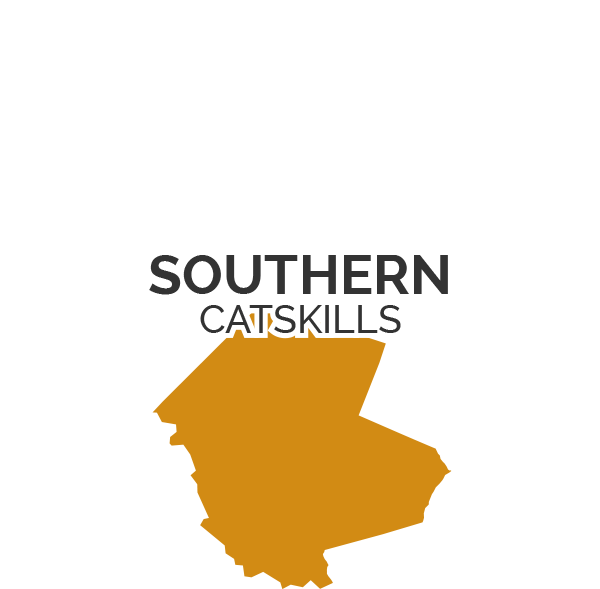 Hit the links in the Catskills on pristine golf courses with incredible mountain views.